Fifteen, maybe sixteen years ago I was honored to interview George Steele at a horror convention. He was there signing for fans more of his portrayal of Tor Johnson in ED WOOD than of his days in the ring, but still granted me time to talk the old business. The FPU regular magazine days were ending at that point, and unable to successfully shop the piece to other mags or find a home for it in other FPU ventures, it got shelved in that purgatory of ‘someday’ projects. Then the obituary column known as The Internet let’s you know on a Friday morning that the legendary wrestler has passed away. So without further delay — a day too late literally and metaphorically — here finally is what is likely the only interview George Steele gave relating almost exclusively not his years as a hirsute lunatic tearing up turnbuckles, but rather his rookie days under a traditional American wrestling mask as a villain called THE STUDENT. FPU: Was “The Student” a character of your creation or a promoter’s ‘gimmick’ so to speak? GS: I never had a ‘gimmick’ in my life. My first [wrestling] name was The Student.. under the mask. There was a reason for it. A ‘gimmick’ is when you do something to just sell a ticket. Never done that. I was teaching at school. I was making $4,300 a year in 1961. I had blown a knee out so my football career was over. I talked to Burt Ruby, the local promoter in Detroit about being a wrestler. I was not a wrestling fan. A friend of mine talked me into that, said I could improve my income a little bit. When I went to talk to Burt, we were talking about my persona. I had talked to the superintendent of schools where I taught. They did NOT want me to be out there wrestling, while still coaching football and teaching. So they said it was fine if I used another name and used a mask. We came up with the name ‘The Student’ because I had never wrestled professionally before, and I was learning the business, so it was a great fit. FPU: So early in learning the trade, was the additional task of wearing the mask a hindrance? GS: There’s a lot of advantages in starting your career under a mask. The key to being successful under the mask is not just having a hidden identity. In the wrestling business, when you portray pain, or hapiness or anything like that and you’re under a mask, it can’t be seen. So you have to do your whole storyline or whatever you’re trying to do in the ring with total body action. So if you’re hit somehwere’s, you don’t just [facial gesture], you’ve gotta do it with body. So I did that for a year and a half / two years under the mask. When I was finally in a position where I had to take the mask off in Pittsburg, because they did not want a masked man [in the ring] with Bruno Sammartino, I didn’t know if I would have any expression or not at all. When I took the mask off, I did have a lot of expression, but I think more importantly I had a lot of body language, and used the body as much as the face to sell. FPU: In your latter career when you were The Animal, you were always extremely animated. Do you attribute that to your period under the hood? GS: Absolutely. That was from day one! I took the mask off in 1964. I was animated then. It was natural. George Steele and the… other person… who uses this body are totally different people, with totally different personas. I say that and people look at me like ‘Ah, OK, here comes a line of bull,’ but it’s very sincere with me. FPU: Did you mind wearing the hood, from a physical standpoint? GS: Oh I loved it! In fact I felt like I was nekkid when I first took it off. FPU: Would you show up at the arena wearing it? FPU: Mil Mascaras was known for that. 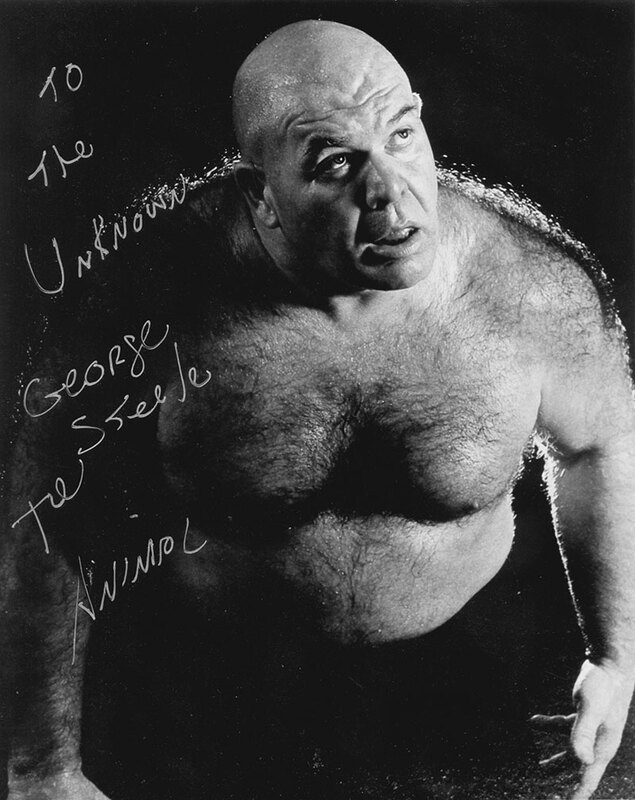 FPU: George ‘The Animal’ Steele was famous for tearing up turnbuckles all the time. Did you ever tear up an opponent’s mask in the same manner? GS: No. I always respected my opponent’s persona. So I tore up the head that was in the mask! FPU: Were you were in the ring with a lot of other masked men? The Masked Superstar maybe? GS: No, I didn’t really wrestle a lot of masked people. Early on when I became George Steele, I was probably one of the baddest of the bad. 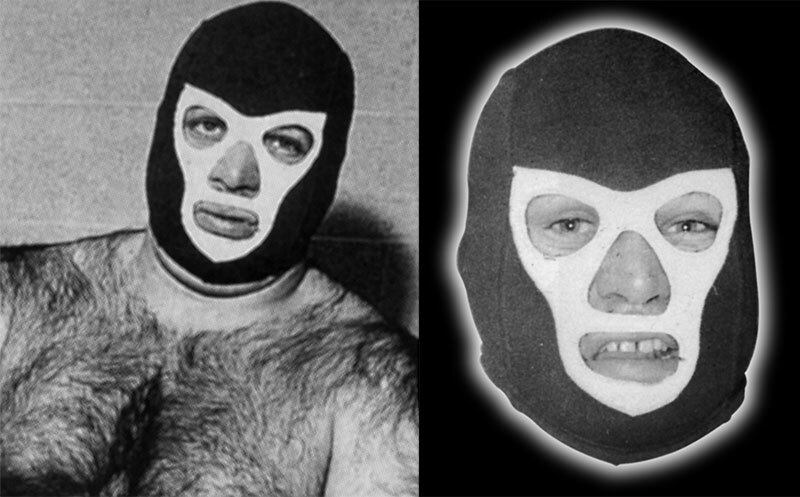 Most of yer masked men were heels, bad guys, except for like Mr. Wrestling in the South. Basically I wrestled only in the Northeast and Detroit area at that period of time, and there were no masked men around, masked men who where baby faces anyway, so there was no purpose in it. FPU: Old-school masks have essentially disappeared today in the U.S., how do feel about that? GS: It’s funny, on a lot of independent shows, all the wrestlers are selling [souvenir] masks to kids. They love ‘em. So the only reason they’ve disappeared is the promoters have made them disappear. When I wore the mask, the deal was if you got beat you had to take the mask off. Later on, they started putting a lot guys under the mask just to beat them, then some left the mask on [anyway]. So it killed the persona of the mask. 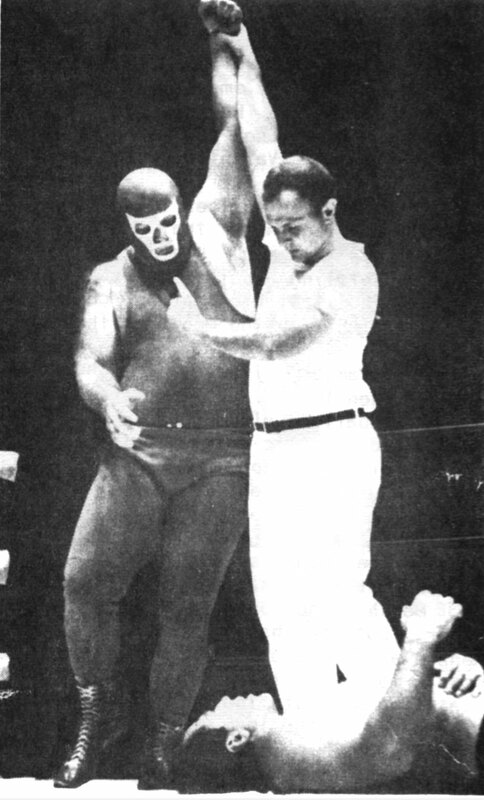 I think it could be recreated, but with only one or two masked men in a territory, and if he lost, he would have to take the mask off. FPU: Make it a real event instead of just another cheap promotional gag? RIP Student Steele. There isn’t a human being who ever saw you wrestle who didn’t love what you were doing in the ring, and that much of your astounding style was the result of a few choice years under a mask is a pretty amazing fact I should have made more people aware of before now.